Caring for safe use of our products and services means recognizing our responsibility regarding exposure to electromagnetic waves, a societal concern. We comply with the legislation in force, both for networks and for devices, monitor developments in scientific research and provide information. Proximus has also been displaying the SAR (Specific Absorption Rate) of each device in all sales channels since 2008, while this only became legally required in 2014. We need the help and commitment of all employees to make the digital future happen. We offer them the chance to bring about positive change, to develop themselves, make a difference, contribute to our results and be our best ambassadors. our workforce to reflect all the different communities in society. 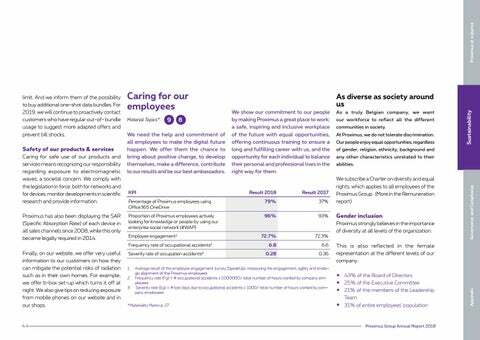 At Proximus, we do not tolerate discrimination. Our people enjoy equal opportunities, regardless of gender, religion, ethnicity, background and any other characteristics unrelated to their abilities. Finally, on our website, we offer very useful information to our customers on how they can mitigate the potential risks of radiation such as in their own homes. For example, we offer b-box set-up which turns it off at night. We also give tips on reducing exposure from mobile phones on our website and in our shops. 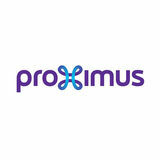 We show our commitment to our people by making Proximus a great place to work: a safe, inspiring and inclusive workplace of the future with equal opportunities, offering continuous training to ensure a long and fulfilling career with us, and the opportunity for each individual to balance their personal and professional lives in the right way for them. limit. And we inform them of the possibility to buy additional one-shot data bundles. For 2019, we will continue to proactively contact customers who have regular out-of- bundle usage to suggest more adapted offers and prevent bill shocks.